Electricity is responsible for almost 75% of accidents in most Industries. Electrical Safety Audit reduces that percentage by taking more precautionary measures such that all lives can be safer. Electrical Safety Audit is a systematic approach to evaluate potential hazards in the electrical facility, and to provide recommended measures to prevent accidents and hazards in workplaces. IT IS MANDATORY TO CARRY OUT ELECTRICAL SAFETY AUDIT AS PER CENTRAL ELECTRICITY AUTHORITY SAFETY REGULATION 2010, TO IDENTIFY POTENTIAL SHOCK AND FIRE HAZARDS, IN INDUSTRIES, COMMERCIAL AS WELL AS RESIDENTIAL COMPLEXES. An arc flash occurs when an electrical path is broken in some way and the electricity jumps or “arcs to a nearby grounded object. We offer Electrical Audit Services to our client. - Carryout studies on the existing plant electrical systems and recommend ways and means to rehabilitate the same to avoid frequent break-downs and improve its performance to maximize production. 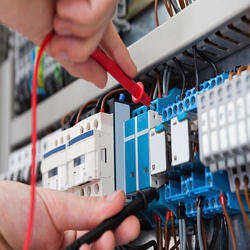 Diploma program in electrical safety and health especially designed short term course to get] oh in big industries. Electrical hazards continue to threaten safety of people and property in the form of shocks, burns, injury, fire and explosion. With electricity having become an indispensable part of our life, electrical risks are to be managed effectively. Expert in the fields of electrical safety audit. Successfully completed various audit of building offices and factory.